Playing in the mud is GREAT fun, until I get hosed off. Have any of you, my loyal readers, ever been sprayed down with a garden hose…with cold water…on a chilly day? Three times? Mmm…well, yes, there is more to the story. On Thursday, My Dad took me to the Dog Park. Sunny, mid 50’s, a slight breeze. We stayed a pretty long time and I played with about 15 different dogs. I noticed this muddy puddle, large enough to three or four dogs to relax in. 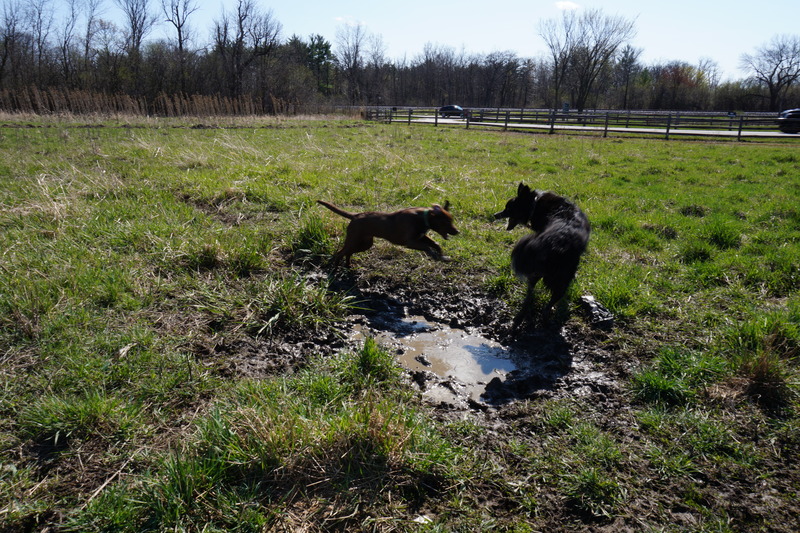 I was experimenting…running through this muddy puddle over and over and over. I could hear My Dad calling to me – ‘get out of there, get out of there” – but when I am having fun at the Dog Park, I am off on another planet. 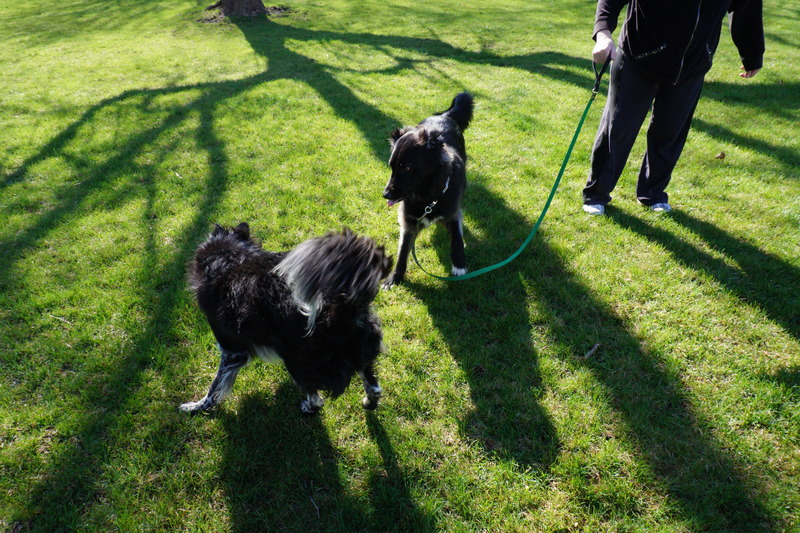 As all of you, my loyal followers, know, I am an EXPERT at enticing my fellow canines to play. I will push you with my nose, get into the LET’S PLAY position, push you with my nose and run away, steal your ball and run away, and if you are not getting the message, I will be VERY persistent. I found the quagmire very interesting, especially the way My Dad kept calling to me to STOP playing in the mud. I started running to the quagmire after enticing another dog to play. 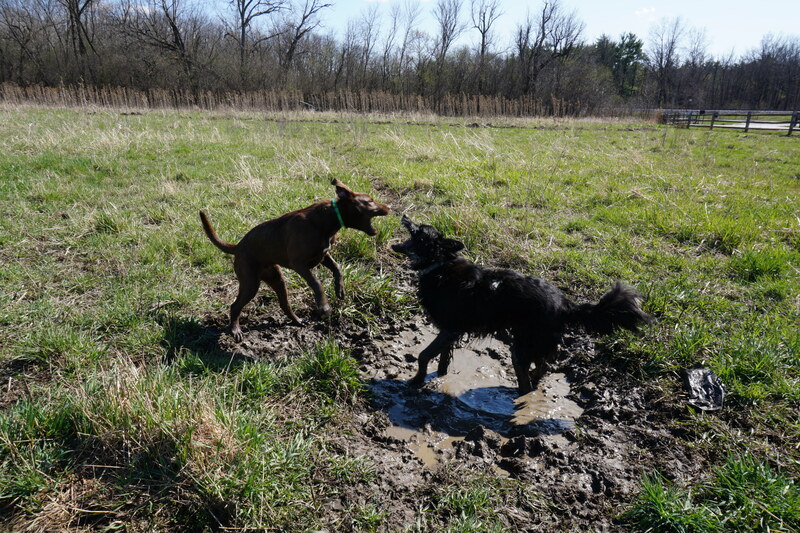 One dog in particular, a reddish Labrador female, also found the quagmire to be a great location from which to launch surprise attacks and engage in prolonged play-fighting. During our chase-me, chase-you pursuit games, the quagmire became our base of operations; on every circuit we would run through the mud. I would crouch in the mud, get into my “stalking wolf” position and the Labrador would slowly stalk me, this was GREAT fun! Our play-fighting base of operations. Why was the quagmire so interesting? Well, it did smell really good! And now for part of the Dog Park, that I was not too happy with – the wash-down area. This is a large gravel pad that has a plastic child-pool and a hose. My Dad sprayed me off and then we went off on some more walking around the Dog Park so I could air-dry. Did I forget about the quagmire? Nope. Some new dogs arrived and I went right back to the quagmire, assumed the stalking-wolf position and very soon I was all muddy again. Before we left, I paid another visit to the wash pad followed by a leash walk around the dog park, just to dry off. When My Dad and I arrived home, I was given ANOTHER bath, outside, the cold hose, soap, and a lot of towels. 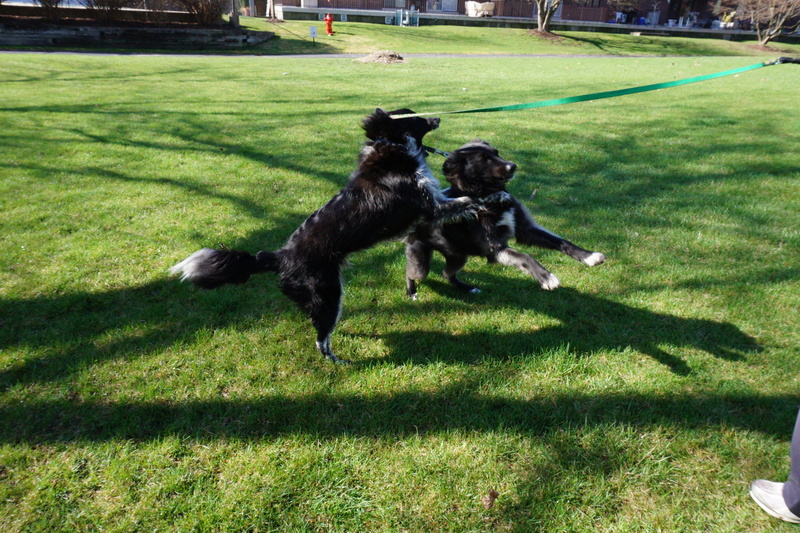 And Brandy and I had some tussle-time, yesterday. Brandy loves me…she lets me climb on her, kiss her ears, and bite her neck. My Dad bought me a new collar. 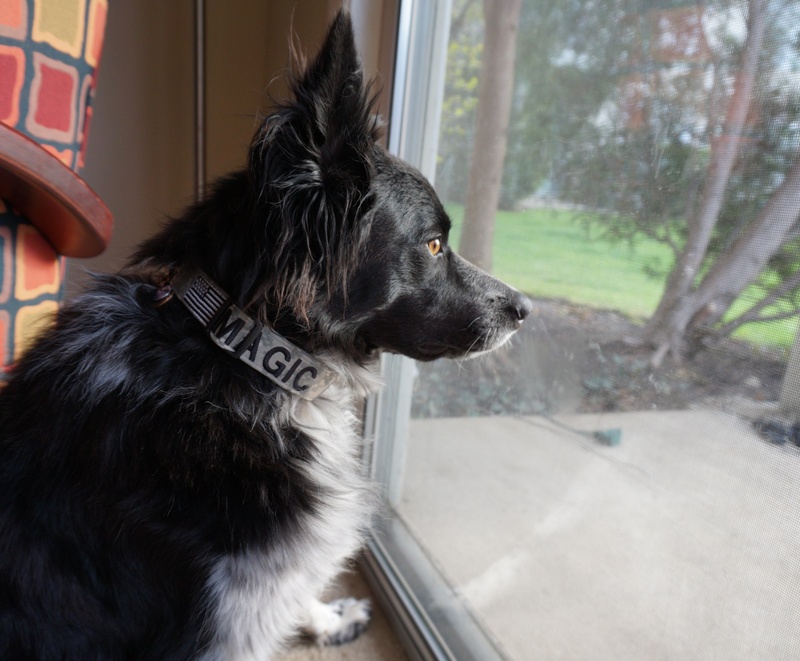 This entry was tagged border collie, border collie rescue, dog, dog behavior, dog rescue, dogs and people, herding dogs, life with a dog. Bookmark the permalink. 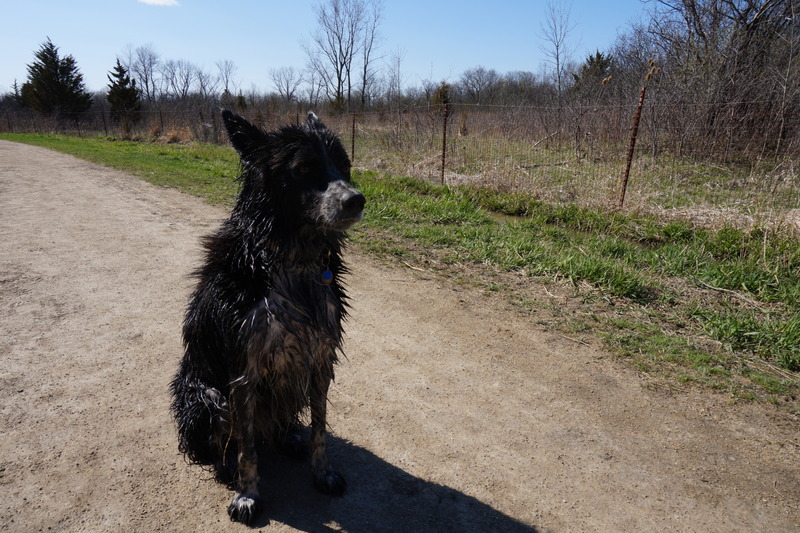 Patrick likes the huge mud puddle at that dog park which is located to the right of the paths as you walk straight in to get to the water in the back.